BRYAN EATON/Staff photo. 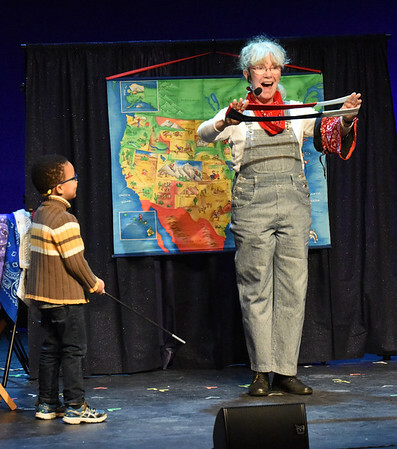 With the help of Adrian Kesselly using a magic wand, Debbie O'Carroll turned three bands into one during her Railroad Magic Show she presented at the Firehouse Center for th entire Newburyport Montessori School on Thursday morning. In her words the show "features participatory stage magic, zany comedy and some renowned heroes, superheroes, unlikely heroes and everyday men and women who intrigue and inspire."